Bright medium burnt sienna color. Bright aromas of blackberries, gauze, clarified butter, and lanolin with a lively, moderately sweet medium body and a smooth, delightful, cheery finish with well-integrated tannins and no oak flavor. There are numerous dessert wines in Italy; today the most popular is Moscato d'Asti from Piedmont. Also in this region is a similarly styled red, slightly sparkling wine called Brachetto. 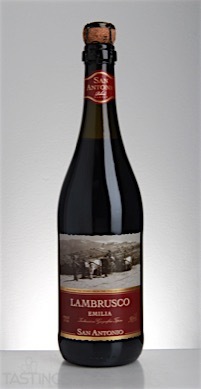 A delightful wine, full of cranberry and strawberry fruit and red rose aromas,this is very light with a touch of sweetness and is ideal consumed fresh with strawberries or peaches. There are other examples of sweeter Moscato from Italy; many of these are very light and medium-sweet; some are mixed with peach juice. These are meant to be sipped near the pool during summer. Other celebrated dessert wines from Italy include Vin Santo - "the wine of the saints" - a lush, very rich sweet wine made from dried grapes. Loaded with caramel, honey and butterscotch flavors when young, these wines age very well (10-15 years) and taste more like dried sherries as they mature. Veneto is home to two other famous dessert wines; both are called Recioto. One is Recioto di Soave, made from Garganega grapes; this is a white dessert wine that is quite rich (though not as full-bodied as Vin Santo); pair with cookies and pastries. The other is Recioto di Valpolicella, made from red grapes used in the Valpolicella district; this is full of black raspberry fruit, is moderately sweet and even a bit decadent! Drink upon release or in ten years' time; pair with chocolate or a blackberry tart. San Antonio NV Lambrusco, Emilia IGT rating was calculated by tastings.com to be 87 points out of 100 on 3/3/2016. Please note that MSRP may have changed since the date of our review.